This 4-day tour of western Korea is filled with a variety of distinct Korean cuisine and the beautiful scenery of the countryside. Somewhat off the beaten path, this western Korea tour is different from eastern Korean tours because the cities that you will visit are not as well known to most people. The tour kicks off in Seoul, goes through the south-western part of Korea with stops in Daejeon and Jeonju, and then heads off to Odongdo Island in Yeosu before finally ending back in Seoul.This delightful cultural experiences of unknown but famous sites will amaze you as a veteran guide escorts you throughout the 4 day course. 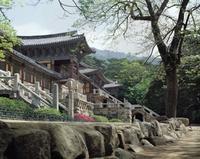 This tour offers you the opportunity to be adventures and visit the parts of Korea that are not that well-known today! Experience modern-day Seoul on a 3-night tour of the South Korean capital! Your fun-filled itinerary includes trips to primary shopping districts, such as Myeong-dong and Paju Premium Outlets. You’ll see fascinating cultural exhibits at the Teddy Bear Museum, Samsung d’light and the K-star Gallery at Korean Wave (Hallyu) Hall. Taste Korean specialties like chicken ginseng soup at Tosokchon restaurant and view the city from N Seoul Tower (Namsan Tower). Upgrade your tour to include the Nanta show (also known as Cookin’), a non-verbal comedic performance that incorporates traditional Korean percussive rhythms. Get an in-depth look at Korean history, culture and religion on this 3-day tour of Gyeongju and Busan, traveling by comfortable private vehicle from Seoul with a knowledgeable local guide. Visit Bulguksa Temple and Seokguram Grotto on the coast of the East Sea, and learn about the Silla dynasty's 1,000-year rule in Gyeongju, site of the ancient city capital. Then see the bustling modern port of Busan, where you'll explore the beaches, famous fish market and the country's largest Buddhist temple. Learn fascinating facts as you enjoy the scenic coastal landscapes! This 7-day bike tour is designed so that you can discover South Korea on two wheels. Travelers will ride bicycles for 600 kilometers along the four river bike paths which are 100% safe and located away from cars. Travelers will discover the real South Korea by staying in hotels, Korean traditional-style guesthouses and motels while enjoying Korean food on the way to Busan. Explore central Seoul on this short stopover tour which includes a 2-night accommodation at a 4-star hotel centrally located in Seoul and an optional leisure night and street food tour upgrade! On this tour, you will see some of Seoul's must see sights such as Gyeongbokgung Palace, Myeongdong and Namsan. Don't hesitate and join this short, exciting and adventurous trip in Seoul today! You can also take some shopping discount coupons and free 'Matina lounge' admission at the Incheon international airport. Enjoy this comprehensive 8-night tour from Seoul, which will introduce you to 18 different famous and historical sites, accompanied by your experienced and professional guide. You will see the best of Korea's diverse and rich culture as well as its history and gastronomy, including a special tea-ceremony with a Buddhist monk. Dive into Korea’s culinary delights and history on this 2-day excursion to Jeonju. Named one of the ‘Creative Cities for Gastronomy’ by UNESCO in 2012, Jeonju has long been considered the culinary capital of Korea. You'll try some of its famous dishes on your tour. You’ll also explore Hanok Village where more than 800 traditional houses have been preserved amidst the modern city. Learn about the Joseon Dynasty which was founded in Jeonju and has influenced much of modern Korea's traditions. Experience the splendor of Mt Seorak, the popular coastal city of Sockcho and the ski resort destination of Pyeongchang on this independent 3-day tour from Seoul. Spend as many hours as you wish in the UNESCO Biosphere Reserve of Seoraksan National Park, where you can hike numerous trails or spot the East Sea during a ride on the Seorak Cable Car. Then enjoy self-guided sightseeing at Sokcho Jungang Market, Daepohang Port and the Daegwallyeong sheep farm. Includes overnight accommodation in Seoraksan and Pyeongchang and round-trip shuttle bus and taxi transport. Explore central Seoul and the DMZ on this short stopover tour which includes 3 night accommodation at a 4-star hotel centrally located in Seoul and an optional leisure night and street food tour upgrade. On this tour, you will see some of Seoul's must see sights such as Gyeongbokgung Palace, Myeongdong and Namsan. Don't hesitate and join this short, exciting and adventurous trip in Seoul today. You can also take advantage of a shopping discount coupon and Incheon international airport free 'Matina lounge' admission.